Fill a large pot 3/4 full with water. Slice lengthwise down the peel of each plantain and chop each plantain horizontally into 3 or 4 chunks. No need to peel it now—it’s significantly easier to peel after boiling! Add the plantain chunks to the pot and bring the water to boiling. Boil for 7 to 10 minutes, until the plantains can easily be pierced with a fork. Use a slotted spoon to remove the plantain. Pull the peels off and discard. 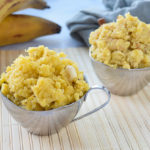 Put the plantain in a large bowl, add the rest of the ingredients, and mash with a potato masher. Add more liquid (ghee or coconut milk) to get to your desired consistency. Easy. As. Pie.